"What would happen if I reached over and pulled off your mask ?" "Joey"s voice dropped a half dozen octaves, and immediately shot back, "I'd rip your heart out." "Fair enough, sir" Snyder replied, and then quickly moved on to a slightly safer line of questioning. 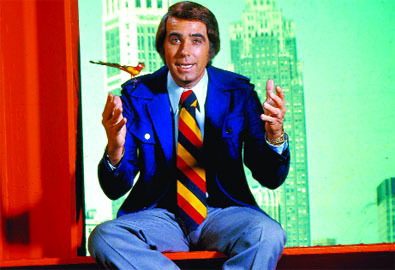 And from that moment on, I began a life-long fascination with Tom Snyder. I can't honestly say I was actually an adoring fan, but back in those pre-VCR days of the late seventies, I did attempt to tune in as often as I possibly could, especially when he had on a guest I had a particular interest in. The thing about Tom was, you just never knew what he was going to say (as pal "Joey" found out). And it was always especially amusing to witness the verbal interplay between the often clueless host and the hot rock acts of the day. Tom was often blatantly a square, but somehow, that only made his attempts to seem otherwise all that more endearing. He was fun to goof on, sure, but mostly, he was just plain fun. I never watched him regularly when he took over the post-Letterman spot on CBS late night in the nineties, but it was just reassuring somehow to know he was there. When he left that gig, a definite era came to a close, one, as they say, unlikely to be repeated again anytime soon. Tom Snyder passed away over the weekend. He was 71. What you saw was what you got, which was key to his unique appeal. "Joey" may've hid behind a mask, but Tom never did. Friends, I always really enjoy drawing the original X-Men. I think it has a lot to do with the fact that visual creator Jack Kirby somehow managed to concoct five characters that, while wearing outfits uniform in design, still each have an unmistakable look all their own! 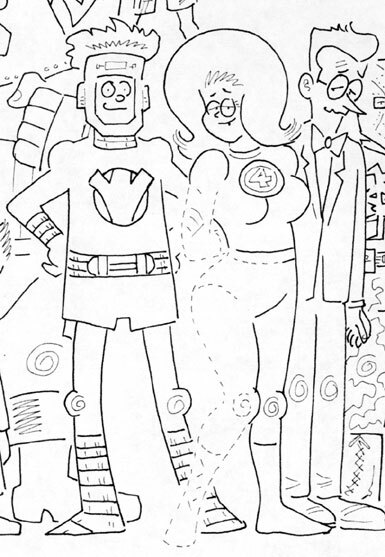 Over to the left you'll see a small diagonal excerpt from a larger illo I did recently of Scott, Hank, Bobby, Warren and Jean--to see the full thing, simply go here. And if you REALLY like it, well, please go here--it's up for bid on good ol' eBay! Yesterday, we went to see "The Simpsons Movie". It's been quite a while since we attended a big flick on its opening day (I think the last one was--not surprisingly--"The SpongeBob SquarePants Movie"), and if it weren't for lingering vacation fatigue, Julie likely would've successfully pressed us to take in Thursday night's 11:59 PM showing rather than the Friday afternoon 12:30 show. The Simpsons are always funny. It wasn't the best episode ever, but it was pretty darn good. And are far as I could figure, the visuals were amped up more than enough to justify a big screen appearance. But you know what REALLY got me excited, sitting in that darkened movie theater? During a seemingly endless slate of coming attractions, a trailer for a film I had absolutely no idea was beckoning on the horizon--much less was even in production--suddenly appeared, and it was all I could do to not squeal loudly in delight. Some of you may be thinking that this statement is meant sarcastically somehow. Here's a further declaration that's sure to raise some eyebrows: I consider 1997's "Bean" to be the funniest movie I have EVER seen. Look, I like comedy. I've ALWAYS liked comedy. Mostly though, even watching the very best comedy extant, I smile, I sometimes chuckle, and once in a while, I even laugh out loud. Rarely do I find myself consumed in paroxysms of laughter, the sort where I just can't stop, eventually finding myself gasping for air. Based on that criteria, "Bean" is--for me at least--the single most hilarious film in cinema history! Because I had that uncontrollable reaction to several scenes (Mr. Bean trying to dry his pants in the men's room comes immediately to mind, as does the sequence unveiling of his doctored version of "Whistler's Mother") not only the first time I saw the movie in its initial theatrical release, but the second time on broadcast TV Christmas Eve several years back--AND then last summer when Julie (who loves it near as much as I do) viewed it again on DVD! I realize that this is not a universal reaction. My buddy, Rocco Nigro, for one doesn't share my opinion, and in fact, told me that the buddy he attended a showing of the movie with back in '97 wanted to get up and leave midway through, declaring it the worst movie he'd ever seen!! Different tastes, y'see. Thing is, while I very much enjoy the original "Mr. Bean" BBC series (though not nearly as much as the British fish thrown into American waters approach utilized by the film), English comedy basically does very little for me. Yeah, I know--ANOTHER highly questionable assertion. Sorry--Monty Python never much appealed to me, Fawlty Towers always left me cold, and I've pretty much avoided everything else comedic from the British Isles. I only stumbled across Mr. Bean by accident, watching a Christmas episode on a lark. But put a frozen turkey on your head, and hey, I'm sold!! 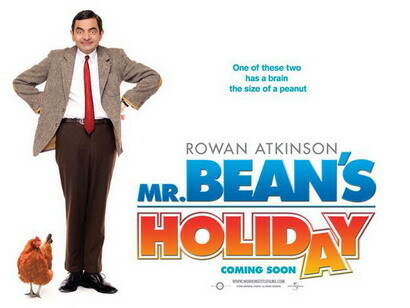 So the day "Mr. Bean's Holiday" hits the nation's multiplexes, I'll be first in line--count on it! Last Friday, Lynn and I drove down to Baltimore to pick up Julie, whose month long pre-college MICA course came to an end that afternoon. We stayed over in Maryland until Sunday morning (Julie's official moving out of the dorms came Saturday morning), and then we drove up to Cape May on the Jersey shore for a few days of sand and surf at the beach. Then, this afternoon, we arrived back home. There's plenty more I could tell you--like, fer instance, how Lynn and I finally watched those three "Lord of the Rings" movies while our daughter was out of town--but the truth is, I'm pretty beat from the long drive home and all the subsequent unpacking, so later for that, okay? Just wanted to check in, is all. Maybe you've heard? Captain America's dead! It was in ALL the papers--right alongside the equally important Paris Hilton news. Never one to let such a milestone event go uncommemorated (or unexploited), the fine folks up at Marvel published a very special edition of FALLEN SON: THE DEATH OF CAPTAIN AMERICA, one with an entirely blank cover, suitable for a custom made illustration. Today is the anniversary of the day my wife was born, said event happening, um, several years back now. Y'know, I'm an awful lucky guy to've found someone who I've never gotten sick of in all the time we've been together! And I'm even luckier to've found someone who hasn't gotten sick of ME!! Many more to ya, babe--and I wanna be there for every single one!! Not all that long ago, you couldn't hope to visit a comics blog without coming across some pretty heated discussion concerning a pricey collectible featuring Peter Parker's lady love, the former Mary Jane Watson, striking a rather...provocative pose. Yeah, YOU know what I'm talking about, don'tcha? Most folks were shocked--SHOCKED, I tell you--insisting that THAT was a side of our costumed hero's gal pals we never, ever saw back in the far more genteel days of our own collective youth. Friends, from the long, long ago year of 1959, allow me to introduce you to a certain Daily Planet reporter (hint: it sure ain't Jimmy Olsen--even given Young Red's occasional proclivity for making similar wardrobe choices himself....). 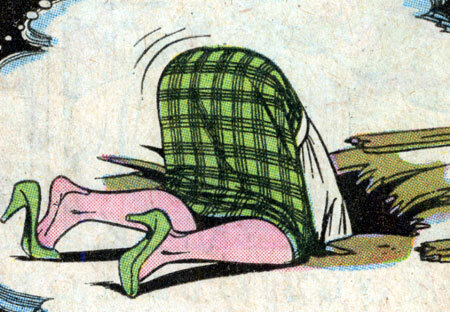 Courtesy of the great Kurt Schaffenberger, that's "Superman's Future Wife" (from SUPERMAN #131, reprinted three years later in the first LOIS LANE ANNUAL). In this quasi-Imaginary tale, Lois is chasing after a pair of super toddlers, NOT doing her hubby's wash. Still, kind of a striking image, don'tcha think? Hey, I for one can't wait to buy the statue! Last month, I donated several drawings to this year's MoCCA Art Festival (read about it in my June 21st entry, see the illos by going here). Producing those drawings, I really had fun doing two in particular, a pair that threw together an unlikely gathering of a widely diverse group of cartoon characters, using only two pen points--one medium width type, the other very fine--leaving out the blacks entirely, giving the art a sort of polarized look. Well, since I'm always looking to have MORE fun, I've done a couple more of these (here's one, a detail of which you can see above; here's the other) ! And since I could also always use a couple of bucks, I've put these two latest drawings up on eBay! So if you like what you see and have some spare cash, go over here and here to make a bid! Hopefully these'll prove popular enough for me to produce an entire series of similar get-togethers--after all, there's still plenty more characters for me to work onto one of these pages! It's been over a week now--daughter Julie's been away at her month-long MICA pre-college program. It sure has been mighty, mighty quiet around here. Not boring exactly, but peaceful. Very, very peaceful. 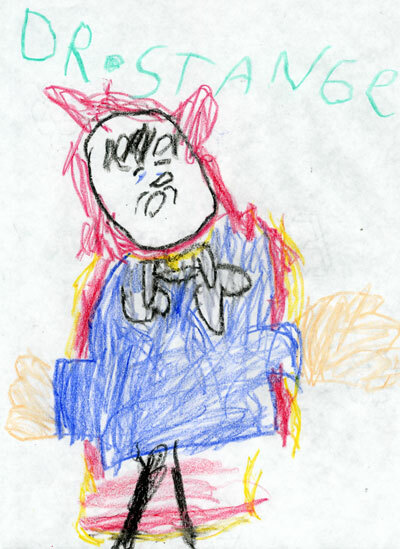 Still, we sure do miss the little scamp, enough so as to share with you a series of super-hero drawings (like the one of "Dr, Stange" above) that she did way, way back in 1996. And because they're so very special, we've put them over on a page all their very own, explanatory text included! That's right--permalinks! 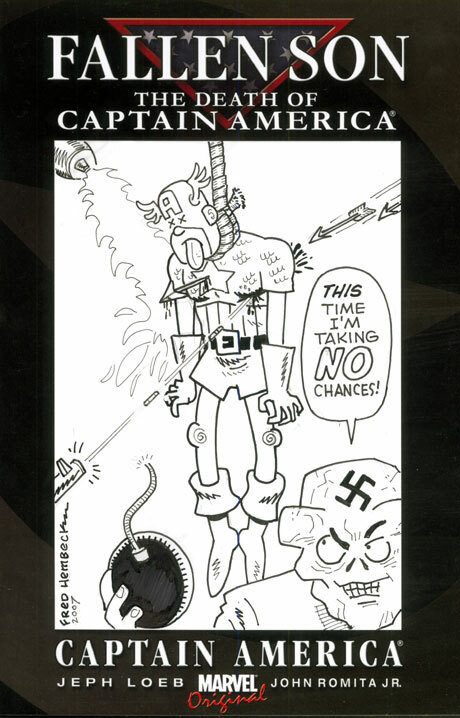 I ask you, HOW then could such noted linkmeisters as Tom Spurgeon, Heidi MacDonald, Dirk Deppey, Neilalien--or even the most powerful comics blogger of them all--Mike Sterling, pass up the rare opportunity to link to the aptly titled Hembeck Art: The NEXT Generation?